In this guest blog, Maurice Nevile tracks the way that articles in ROLSI have coped with the complex task of choosing what terms to use in describing…. well, what to call it? Bodily movement? Embodied activity? Gesture? Each of these (and many more) have pros and cons as descriptors. But with the rise of multi-modal analysis in CA, there may be a growing need for some sort of consensus. In studies of language and social interaction there are many ways to refer to the contribution of the body. I was surprised to discover just how many when preparing a review paper (Nevile 2015) to track the growth of ‘embodiment’ in 400+ ROLSI papers from its first issue right up to 2013. ROLSI authors used over 200 forms of wording, mostly paired terms, to refer generally to the body, and not to some specific analytic phenomenon (as best I could determine). That review discussed the possible significance of such wide terminological variation for analyses, and for the field more widely. I also made a list of all the terminology choices, grouping them according to the core first word in common, and the list is now publicly available here. In short, the list represents an overview of many researchers’ attempts to capture in wording how participants’ bodies contribute to naturally occurring social interaction, to its conduct, organization, and intelligibility. My review focussed mostly on the first word of each terminology pairing, on authors’ choice of ‘body’, ‘embody’, ‘gesture’, ‘multimodal’, ‘nonverbal’, or ‘visual’ (i.e. ‘body motion’, ‘embodied behavior’, ‘gestural cue’ etc.). I noted some challenges and possible problems. Of the second (or following) terms in such pairs I considered ‘action/activity’ (as in ‘bodily activity’), but likely there is more to appreciate for how terminology choices can express particular distinctions and nuances relative to data, and analytic interests and demands. For example, wordings indicate how the body figures within the whole interaction process, for example as ‘aspect’, ‘channel’, ‘component’, ‘dimension’, ‘domain’, ‘element’, ‘feature’, ‘item’, etc. Or, wordings refer to what the body does, what participants do with their bodies, like ‘comportment’, ‘deployment’, ‘endeavor’, ‘experience’, ‘expression’, ‘involvement’, ‘movement’, ‘performance’, ‘work’ etc. Some terms suggest a closer sense of the character of the body’s interactional contribution (e.g. sequential position) as ‘clause’, ‘cue’, ‘information’, ‘message’, ‘pattern’, ‘reaction’, ‘response’ etc. 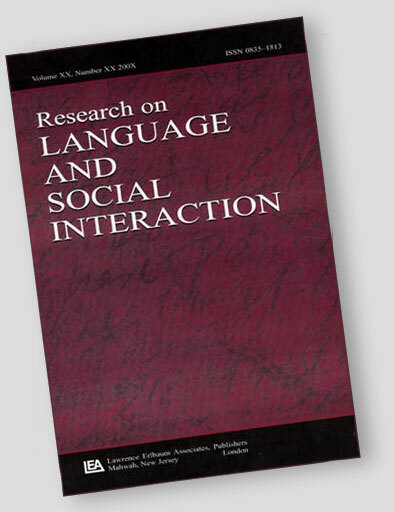 Significantly too, wordings for the body in interaction often manifest the particular concerns and approaches of papers within the ethnomethodology and conversation analysis tradition, like ‘achievement’, ‘conduct’, ‘doing’, ‘environment’, ‘organization’, ‘orientation’, ‘phenomenon’, ‘practice’, ‘resource’, ‘semiotic’. And there are about 180 more where that came from! How can researchers use the list? The list can help researchers to ponder the relative value of different wording possibilities, for preferred wording to deal with their own data or phenomena, and suiting their own writing style and audiences. The list might offer an ideal word or wording combination, or prompt something new instead. Or, writers could see how their own previously-used terminology relates to what other authors have used. Someone especially keen could examine terminology change over time, and how terminology can reflect or even promote certain conceptual and analytic understandings or directions of the field as a whole. For example, note the variation across ‘multichannel communication code’ (used in 1987), ‘multimodal activity system’ (1999), and ‘multimodality of action formation’ (2010). Such change might indicate the influence of particular authors, or of particular insights and discoveries. I have used here the expression ‘body in interaction’, combining ‘body’ and ‘interaction’. I can’t immediately see that any ROLSI author has used this phrase (up to end 2013 at least), and a quick Google search showed just two relevant uses. It complements ‘talk in interaction’, but how does it sit alongside ‘gesture-in-interaction’, ‘multimodal interaction’, ‘visible form of interaction’, ‘embodied interactional conduct’, and ‘embodied communication in interaction’? If you were stuck alone on an island and could choose only one of those, which would it be? I hope colleagues find the list interesting and helpful, and that it promotes discussion and awareness. Terminology for the body in social interaction, as appearing in papers published in the journal ‘Research on Language and Social Interaction’, 1987-2013.